The mission of God's Love We Deliver is to improve the health and well-being of men, women, and children living with HIV/AIDS, cancer, and other serious illnesses by alleviating hunger and malnutrition. 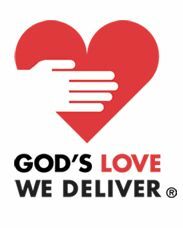 God's Love prepares and delivers nutritious, high-quality meals to people who, because of their illness, are unable to provide or prepare meals for themselves. The organization also provides illness-specific nutrition education and counseling to clients, families, care providers, and other service organizations. All of God's Love's services are provided free of charge without regard to income.  Click on logo to enter the site.